community members for the volume of service to the community. Donors of US $1,000 or more to the Annual Programs Fund, PolioPlus, or the Humanitarian Grants Program, or people who have that amount contributed in their name, can also be recognized as Paul Harris Fellows. 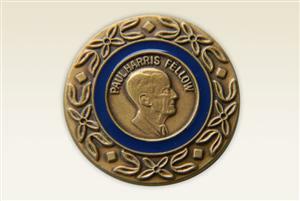 Each new Paul Harris Fellow receives a commemorative certificate and a pin.